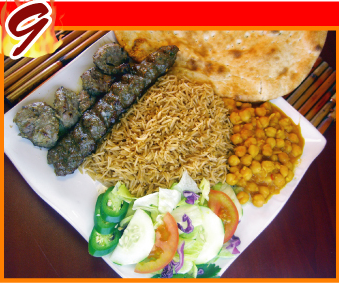 Kabob Specialties All kabob dishes are served with your choice of rice, homemade tandoori bread, small Greek salad with one side dish from buffet and chatnee sauce. 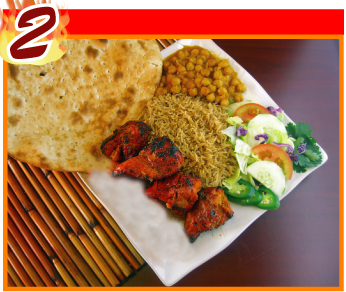 Boneless pieces of chicken breast marinated in special herbs and spices, broiled on a skewer over tandoori flame. 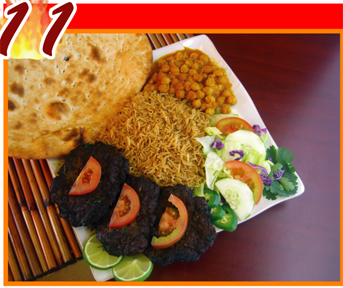 Pieces of bone-in chicken, marinated in special spices and herbs, broiled on skewers over tandoori flame. 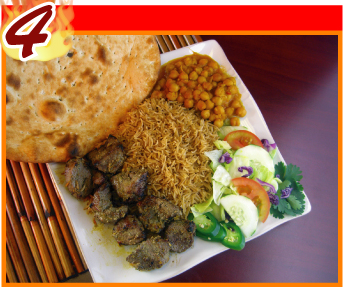 Delicate chunks of tender lamb, marinated in special herbs and spices, broiled on a skewer over tandoori flame. 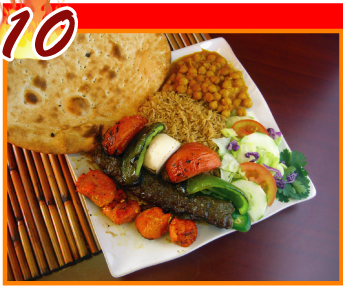 Combination of chicken, beef and lamb kabob. Very delicate and tender marinated lamb ribs and char broiled on the grill golden brown, very tender and juicy. Combination of chicken breast and lamb kabob, one skewer of each. 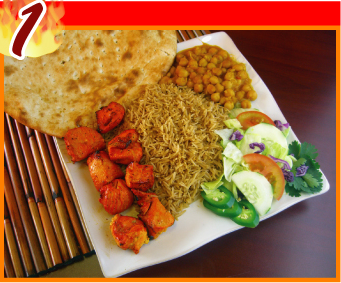 Combination of chicken breast and kubideh one skewer of each. 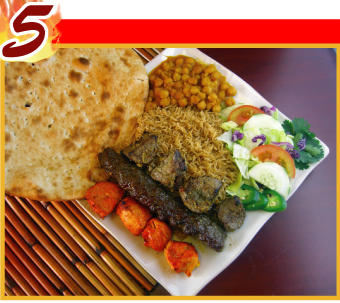 Combination of beef and lamb kabob. 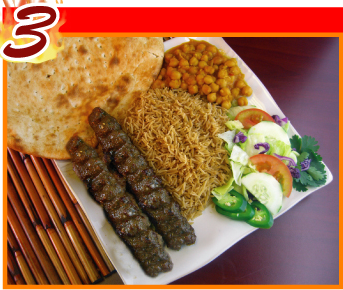 Combination of two skewer of kabob of your choice (beef, chicken, lamb) and one skewer of vegetable kabob. Grounded beef mixed with chopped onions, tomato, green pepper, egg yolk and special dried hot pepper and seasonings. 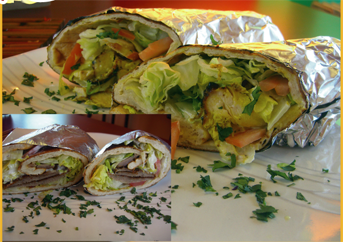 Kabob Wraps All wraps are served on our homemade tandoori bread, and one side dish. Sauteed slices of beef filet, lettuce, tomato, onion and tzatziki sauce (cucumber sauce). 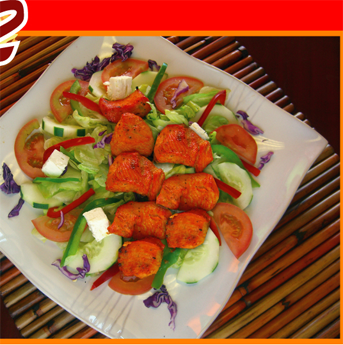 Your choice of chicken, kubideh or lamb comes with lettuce, tomatoes, onions and our house dressing. Skillfully season lamb under a heap of spiced brown rice, topped with carrot strips, and raisins served with meat sauce (qurma). 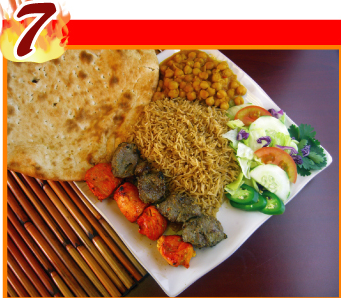 Choice of seasoned brown served with meat sauce and choice of chicken or lamb kabob. Subzi seasoned spinach topped with yogurt, served with seasoned basmati rice. 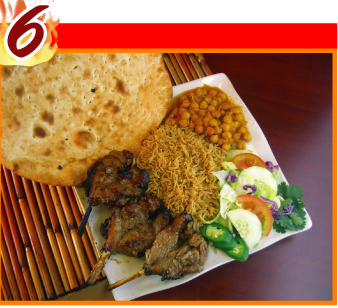 Choice of charcoal-broiled lamb, chicken, fried with onions, tomatoes and green pepper mixed with special seasoning. Deliciously seasoned pieces of lamb under a mound of saffron rice, served with meat sauce. Homemade Afghani style salad, Diced cucumbers, tomatoes, onions and herbs in fresh lemon juice. Lettuce with Feta cheese, Caesar Italian dressing and layered with lamb. 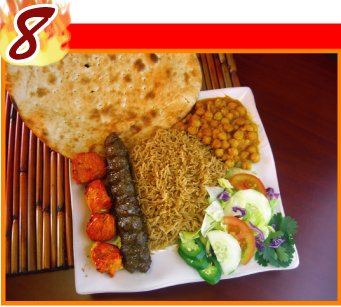 Broiled fresh vegetables on a skewer served on Afghan bread with one side dish from buffet & seasoned rice.